Recreational Boating Market size was over USD 146 billion in 2016 and is estimated to exhibit around 6% CAGR from 2017 to 2024. Rising disposable income has resulted in increased travel and tourism activities across the globe, primarily driving the industry growth. Usage of these boats for numerous activities including boat racing, motorized water sports, sailing, and campaigning has positively impacted the excursion boat sales. High consumer confidence owing to advantages such as advanced technology and high-tech features will further escalate the recreational boating market revenue generation over the next eight years. Emerging countries in the globe have witnessed a substantial improvement in economic conditions. This has resulted in increased consumption expenditure on leisure activities. Moreover, ageing of motor boat fleet will give rise to increased demand for new boats owing to regular technological advancements, especially in the outboard engine boats. Moreover, these boats offer all-in-one experience ranging from cruising & water sports to fishing, thereby strengthening the penetration of recreational boating market from 2017 to 2024. Small scale production of SMEs and conventional boat building procedures might not cater to the rising product demand, hampering the marine leisure industry growth over the forecast timeframe. These SMEs lack financial access and face export barriers due to high tariffs. Lack of efficient standards in various regions along with high dependency of these services on domestic and non-residential visit will further pose a challenge before the market participants. Recreational boating market players are focusing on adding various marine technologies in these pleasure crafts. Global navigation satellite system (GNSS) is a key trend, continuously gaining prominence in the industry. This system offers significant advantages to both the direct and indirect users. It is majorly used for surveillance and traffic management in both sea and inland waters. Moreover, these systems are used for various other purposes such as search & rescue and fishing vessel control. These advancements are likely to instigate immense potential to the industry size over the next eight years. 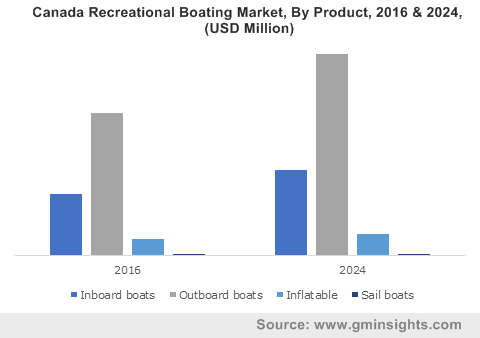 Recreational boating market from outboard boats is likely to capture maximum revenue share crossing USD 135 billion by 2024. Easily accessed mounting position of outboard engines provides more space for the user, thereby shifting the consumer’s preference. This can also be attributed to the provision of benefits such as cost effectiveness, easy maintenance & easy service abilities coupled with high reliability. Inboard boats are anticipated to grow rapidly, exhibiting around 4.5% CAGR from 2017 to 2024 owing to their high usage in water sports such as skiing. They are extensively used in light weighted boats such as fishing boats owing to the requirement of separate rudder to steer and low center of gravity. However, high costs along with provision of less cabin space may curb the recreational boating market from inboard boats. Engine power accounted for over USD 145 billion in 2016 and will continue showcasing the dominance in the recreational boating market over the forecast timeline. The high revenue generation can be attributed to extensive usage of engines in inboard, and outboard boats. High demand from established countries that include U.S., Russia, and Japan will further support the industry dominance till 2024. Man-powered boats are likely to grow significantly, witnessing around 4% CAGR from 2017 to 2024. Rising demand for leisure and fun activities such as water sports, river rafting, etc. across the globe will propel the industry growth. Cost effectiveness as compared to the counterparts will further strengthen the market from man-powered boats over the coming years. North America, led by U.S. recreational boating market is likely to witness healthy growth over the next eight years. Established marine industry in U.S. and Canada along with continuously increasing number of participants involved in boating will primarily contribute to the revenue generation. As per National Marine Manufacturers Association (NMMA), approximately 46% of the population in Canada participated in boating. Presence of key industry players such as Brunswick and American Sail Inc. across the region will further support the regional dominance till 2024. Europe recreational boating market is likely to grow substantially, witnessing over 5% CAGR from 2017 to 2024. Increasing manufacturing, especially in countries such as Italy will essentially drive the regional growth. The shipbuilders in Italy are focusing on exporting their products to the developing and international markets over the past few years. Availability of cost effective and skilled labour force coupled with production of excellent quality boats across the region will further strengthen the industry penetration over the coming years. Brunswick, Ferretti, Malibu Boats, Beneteau, Sunseeker, American Sail Inc., MacGregor, Hunter, and Azimut-Benetti are among the noticeable participants in the recreational boating industry. Other prominent players include Princess Cruise, Hobie Cat Corporation, Bavaria Yachtbau, and Catalina Yachts. The competitors are indulged in adopting mergers & acquisitions as their prominent strategy to enhance their visibility in the industry. For instance, in July 2016, Brunswick acquired Thunder Jet, a designer and manufacturer of aluminium boats. It helped Brunswick in expanding their portfolio and strengthen its position in the industry. In August 2014, the company completed the acquisition of a distributor of recreational products, Bell Recreational Products Group. This acquisition helped the company in solidifying its hold across the region along with enhancing its visibility among the customers. Similarly, in June 2017, Malibu Boats entered into an agreement for acquiring Cobalt Boats LLC, a manufacturer and distributor of outboard boats, for USD 130 million. It helped the company in expansion of its customer base by showcasing extensive range of products in its portfolio. These aggressive strategies will offer stable growth prospects for the recreational boating market participants. Luxury vessels are basically designed for leisure and fun activities on water surface. It includes many activities such as sailing, boat racing, fishing, and other water sports. These boats are generally made up from materials such as aluminium, coated fabrics, and plastic. Advancements in boat technologies, increased size of boats, improving global economic conditions, and increasing high net worth population across the globe are factors responsible for attraction of recreational boating. However, lack of financial access along with export barriers for the small players will hamper the market growth. 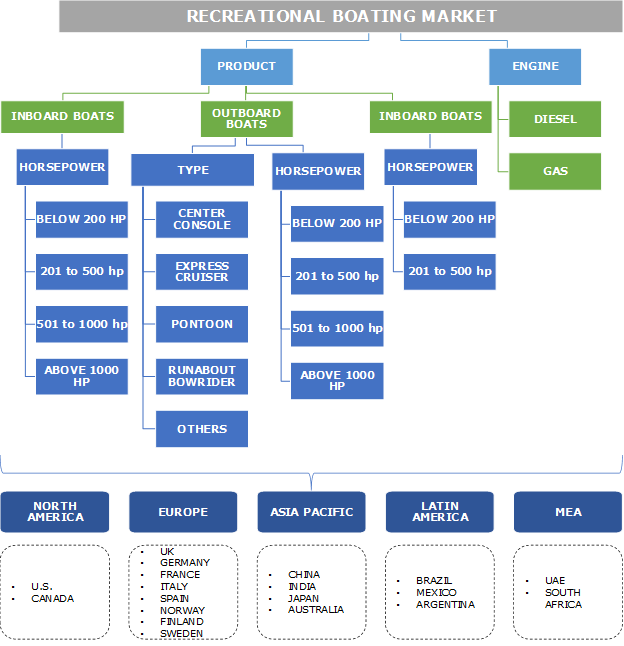 Recreational boating market is dominated by the small players or the SMEs. Advent of various trends that are significantly impacting the industry dynamics include usage of absorbed glass mat batteries in engine-powered boats owing to its enhanced durability than lithium-ion batteries. Moreover, adoption of synthetic materials for reduction in wood usage will positively influence the industry till 2024.